Marketing, Social Media, Planes, Trains, Conversations & Life on a Blog. Posted by Arun Rajagopal in Conversations, Digital, Social Media. How cool is it to be part of a marketing book that is written by some of the brightest, smartest and greatest minds in marketing, communications and social media from around the world? How cool is it to be part of a collaborative book that is authored by not one, not two, but 237 bloggers from 15 nations across the globe? 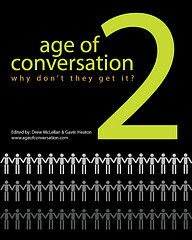 How cool is that the book is based on the theme ‘Why don’t people get it?’ and goes on to share unique perspectives on topics such as Manifestos, Keeping Secrets in the Age of Conversation, Moving from Conversation to Action?, The Accidental Marketer, A New Brand of Creative, My Marketing Tragedy, Business Model Evolution, and Life in the Conversation Lane? How cool is that my chapter ‘The Smart Beast in the Creative Jungle’ talks about creating a successful creative niche in this highly dynamic and interactive era of conversation? How cool is that the book’s collective wisdom will help you create conversations, deliver results and generate impact? How cool is that proceeds from book sales will benefit Variety, a children’s charity that does good work around the world? How cool is that you can go online and get your own copy of the book in hardcover, paperback and downloadable e-book formats within minutes ? Yes, it’s so totally cool that ‘The Age of Conversation 2’ is finally here!!! And if you agree with me, please click here to order your copy. And last but not the least, how cool is it to be in such great company? Time to break the radio silence – I’m back!